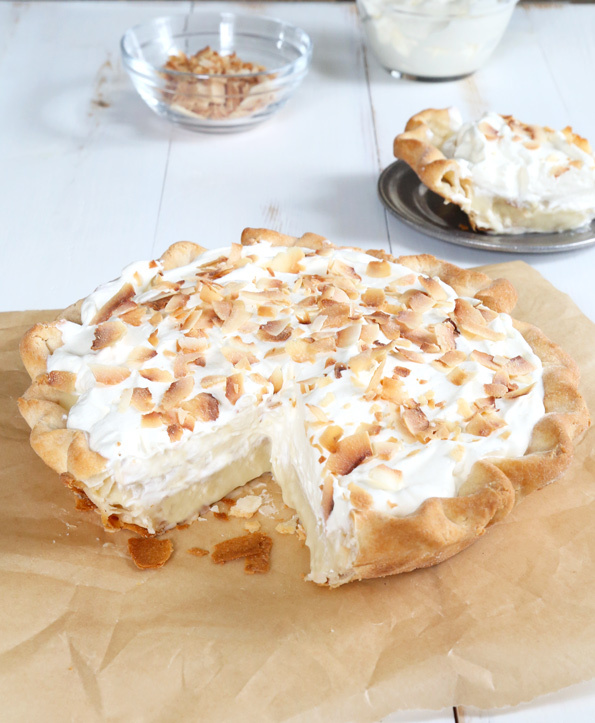 Gluten Free Coconut Cream Pie | Great gluten free recipes for every occasion. It’s nearly Thanksgiving, and that means that in just a few short days your table is going to filled with people expecting to eat (among other things) some serious pie. And since oven space is at a premium on The Big Day, and you’re already making that apple pie in a bag (please tell me you’re making that! 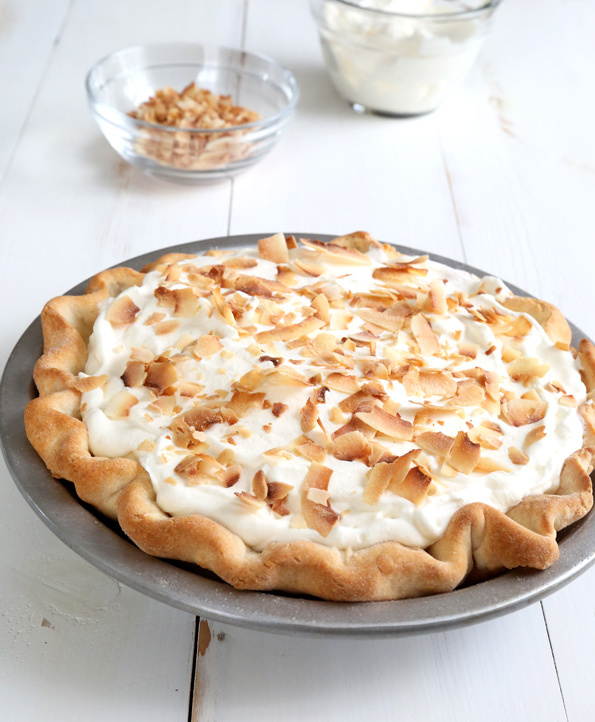 ), a make-ahead Gluten Free Coconut Cream Pie is just the thing. Don’t you think? It’s easy! C’mon I’ll show you. See? Easy. If you’re looking for step-by-steps for making the dough for the pie crust, look back at that apple pie post, and you’ll find all you need. But for this gorgeous, smooth coconut cream pie, we’re not baking the filling, and it’s a single pie crust—not a double. Not only does this pie insist upon being made ahead, but if you felt like making it even 2 days ahead of time, it would be good as new on Thanksgiving (or any old day you’d like to serve it, of course). The filling calls for light canned coconut milk (I used Thai Kitchen brand), so be sure you don’t reach for a carton of coconut milk—or full-fat coconut milk in the can, which is just too thick. This is an important skill, too, this making-a-single-flaky-gluten-free-pie-crust. The big secret? Don’t be so afraid of overbaking the crust! That’s how you get a flaky crust, even when the filling is wet like this coconut cream. You’re looking for the crust to be lightly golden brown all over. You might find that the bottom of the crust even gets a little darker, like mine did—and that’s perfectly fine. As long as you’re careful not to let it burn, all will be well. A note about the filling: This filling will slice clean, but don’t expect it to set up like a pie made with gelatin. If you’d like the pie to slice more like fudge, simply do the following: bloom 1 packet of powdered unflavored gelatin in 2 tablespoons of cool water and allow the gelatin to swell (about 3 minutes). Add the bloomed gelatin to the hot filling mixture right before you add the chopped butter. Mix until the gelatin is melted, then remove the pan from the heat, add the chopped butter and proceed with the recipe instructions. Make the pie dough. In a large bowl, place the flour, xanthan gum, baking powder and salt, and whisk to combine well. Add the chopped and chilled butter, and toss to coat it in the dry ingredients. Flatten each chunk of butter between your thumb and forefinger. Add 1/3 cup of water and mix until the dough begins to come together. Add the remaining water by the teaspoon until no part of the dough is crumbly. Turn out the dough onto a lightly floured piece of unbleached parchment paper and press into a disk. Sprinkle the dough lightly with more flour, and roll it out into a rectangle that is about 1 inch thick, moving the dough frequently and sprinkling it lightly with flour if it begins to stick. Fold the dough over on itself like you would a business letter. Sprinkle the dough again lightly with flour, and roll out the dough once again into a rectangle about 1 inch thick. Twice more, remove the top piece of parchment paper, sprinkle lightly with flour, and fold the dough over on itself like you would a business letter. This will smooth out the dough and make it quite easy to handle. Wrap the dough tightly in plastic wrap and place in the refrigerator to chill. *At this point, the raw pie shell can be wrapped tightly and frozen for up to a month. Bake the pie shell. Remove the pie plate from the freezer and place a large piece of unbleached parchment paper in the center of the crust. Place pie weights or dried beans in a single layer in the center of the pie crust, on top of the paper. Place in the center of the preheated oven and bake for 8 minutes. Remove from the oven and remove the paper and pie weights. Return to the oven and reduce the oven temperature to 375°F. Continue to bake until the crust is lightly golden brown all over (8 to 10 minutes more). If you don’t bake the crust until it is golden brown all over, your pie will have a soggy crust once it is filled. Remove the pie crust from the oven and allow it to cool completely. Toast the coconut chips. Place the coconut chips in a single layer on a rimmed baking sheet lined with unbleached parchment paper. Place the baking sheet in the center of the preheated oven and bake until the chips are lightly golden brown all over and smell fragrant (about 6 minutes). Remove from the oven and allow to cool completely. Make the filling. In a medium-sized, heat-safe bowl, place the flour blend, sugar and salt, and whisk to combine well. Add 1/2 cup (4 fl. oz.) of the coconut milk, and then the egg yolks, whisking to combine after each addition. Set the mixture aside. In a medium-sized heavy-bottom saucepan, place the remaining 2 1/2 cups (20 fl. oz.) milk and bring to a simmer over medium-high heat. Once the milk reaches a simmer, remove the saucepan from the heat and add the hot milk to the bowl with the egg mixture in a slow trickle, whisking constantly to combine. The purpose of adding the hot milk slowly is to avoid cooking the egg yolks by bringing them up to temperature slowly. Once all of the hot milk has been added, pour the whole mixture back into the saucepan and return to the heat. Cook, whisking constantly, over medium-high heat until thickened enough that the whisk leaves a visible trail in the mixture as you whisk it (2 to 3 minutes). Remove the pan from the heat, and add the chopped butter and the vanilla, and stir until the butter is melted and the mixture is smooth. Crush about 3/4 of the toasted coconut chips, add them to the filling, and mix to distribute the coconut evenly throughout. Pour the filling into the cooled shell and spread into an even layer. Allow the filling to cool for about 5 minutes. Cover the pie with plastic wrap, placing the plastic directly on the surface of the filling to avoid its developing a pudding “skin.” Place in the refrigerator to chill until set (at least 2 hours and up to 2 days). Make the topping and serve. In the bowl of a stand mixer fitted with a paddle attachment (or a large bowl with a hand mixer), beat the heavy whipping cream and the confectioners’ sugar on medium-high speed until stiff (but not dry) peaks form (about 3 minutes). Beating the cream on medium-high for a longer time instead of high speed will make a more stable whipped cream. Remove the plastic wrap from the chilled pie and spread the whipped cream on top and sprinkle with the remaining toasted coconut chips. Slide the pie out of the shell onto a cutting board before slicing with a wet knife and serving. Nicole, I made this pie crust for my pumpkin pie; used your Better than Cup4Cup flour blend. I omitted the 3/4 xanthan gum from the pie crust recipe above since it is in the flour blend. Then chilled the dough before rolling out and putting in the pie pan. At this point, I wrapped it and froze it for 3 days before thawing and then baking for 10 minutes per your recipe, cooled, then put my pumpkin in and baked 45 minutes at 350 until the pumpkin custard was baked. The crust had great flavor but was extremely hard to cut. It also was not ‘light’ in color as your photo. Where did I go wrong? I would like to “get back on the horse” and make another pie right away but need your guidance. Thank you. My guess is that you overworked the pie crust, Deborah. You really need a light touch when working with pastry, and you have to use extra flour only very sparingly. If you overflour the crust, and/or if you break up the butter into too-small pieces, you’ll end up with a flat, tough crust. So I think your issue comes down to technique. You really need to follow my instructions really carefully! Try reading through my apple pie in a bag post for more guidance. That should help! I’m attempting to modify this to be dairy free. Wish me luck. It looks delicious! Good luck! Please let us know how it turns out! Is it possible to make this egg free nicole? I’d use the crust and topping from this recipe, and then search online for a GF, vegan filling. Custards rely heavily on eggs, so this doesn’t seem like a recipe that can be tweaked. It would need a total re-haul. But I’m sure someone has made an egg-free coconut custard before! So perhaps use Nicole’s awesome crust and general method, but find a different custard recipe. A Franken-pie mash-up of recipes, but should be just as tasty!! I’m making apple pie in a bag! Printed it out to the other day, but just came to the site to get the BB pastry flour hack. For the filling, could I use Better Batter or does it need to be a GF flour without xantham gum? Thanks. You cannot use Better Batter, Cammi. You need to use a gum-free blend! Xanthan gum will make a gummy mess of custard. my dad loves coconut! am going to make this for him for him for christmas.thanks nicole! I am making apple pie in a bag too! I am doing a totally GF Thanksgiving only because of you! My family has such confidence in your recipes (or how I can adapt mine with what you do) that I do not have to make for them and then for me! I made my first loaf of Japanese Milk Bread last night to use for stuffing. I forgot to turn the oven down. Good thing it is for stuffing because it is a little dry. It tastes great though! I have another loaf to bake tonight and corn bread too. Sink clogged big time so I had to stop. Still waiting to hear from the plumber. Not at all happy about this! I am so far behind on my prep. Looks like only 2 pies will be baked tomorrow. I will do more over the weekend. This is the only time of year I make pies, so my family expects a bunch of them. They’re not coconut cream fans though. I am going to play with your butterscotch pudding recipe on Friday to see if I can get it to be a butterscotch pudding pie. That is my favorite. I would bloom 1 packet of gelatin in 2 tablespoons water, and then add it to the butterscotch pudding when it’s hot, Mare, and then pour that into a parbaked pie shell. Just use this No Bake Chocolate Pudding Pie as a guide, Mare and you’ll do great! You rock! I did not even know about the No Bake Chocolate Pudding Pie until today. So many recipes….so little time! Eeee! Thank you! You’ve perfectly captured my dreams of a perfect coconut cream pie. I’m so excited to make this one for Thanksgiving so that I can be sure to have a dessert. (And I love that my oven will be free for other treats.) This looks so much like the ones my aunties make way back home. It’ll be fun to introduce my in-laws to the wonders of *homemade* pies. Thank you for the tip about whipping cream at a lower speed for more stability, too; I never knew that! I forgot you’re Canadian, Lucy! I think the apple pie is just perfect for every fall/winter holiday no matter what, but I also love chocolate pudding pie and key lime pie, too. And of course … TONS of cookies! I’m making the apple pie in a bag. Just for you! And the family, but really, mostly for you. Come on over, it will be delicious! Aw, Anneke, I so wish I could! I can’t even imagine being a guest in someone else’s home for a completely gluten free Thanksgiving that my son and I could totally eat carefree!